FILE - President Isaias Afwerki of Eritrea addresses the 66th session of the United Nations General Assembly at U.N. headquarters, Sept. 23, 2011. Eritrea’s president says he will send a delegation to Ethiopia to discuss Prime Minister Abiy Ahmed’s pledge to implement the terms of a peace deal negotiated in 2000. Agreeing to that deal means ceding occupied land back to Eritrea and honoring a 2002 international court ruling that awarded Eritrea the disputed town of Badme. Eritrean President Isaias Afwerki announced the overture Wednesday in Asmara in his annual Martyr’s Day address. He said the delegation would also “chart out a plan for continuous future action” between the countries. Ahmed’s chief of staff, Fitsum Arega, later said on Twitter the prime minister is ready to welcome the Eritrean delegation. Eritrea and Ethiopia share a violent history. Eritrea fought a 30-year war for independence to break away from Ethiopia. It gained international recognition in 1993. However, conflict between the countries persisted, particularly on their border, which was disputed. Between 1998 and 2000, the countries fought a border war that resulted in at least 70,000 deaths. Since then, tensions have remained high. But in his speech Wednesday, Afwerki emphasized shared struggles and losses between the Eritrean and Ethiopian people. He blamed historic animosities on “misguided global policies” and the “toxic and malignant legacy” of the TPLF, the Ethiopian political party that, for decades, has controlled the country’s political and security spheres. But sweeping changes have occurred in Ethiopia. Ahmed, the new prime minister, represents a different party within Ethiopia’s ruling EPRDF coalition and belongs to a long-marginalized ethnic group, the Oromo. Earlier this month, he replaced the army’s chief of staff. 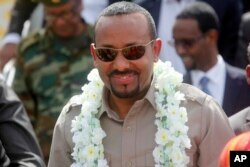 FILE - The new prime minister of Ethiopia, Abiy Ahmed, visits Mogadishu, Somalia, June 16, 2018. In his speech, Afwerki also said the United States had been "sending various signals" about its intentions to correct past wrongs, including its policies in the Horn, but he did not elaborate. In late April, Ambassador Donald Yamamoto, the acting assistant secretary for the U.S. Bureau of African Affairs, made a rare visit to Eritrea, although neither country disclosed details of the meeting. Some residents in Badme, which remains occupied by Ethiopia, told Reuters they are upset about Ahmed’s decision. Reports of protests in the small town have also circulated in recent days. FILE - An Ethiopian military officer stands guard on the outskirts of Badme, a territorial dispute town between Eritrea and Ethiopia currently occupied by Ethiopia, June 8, 2018. 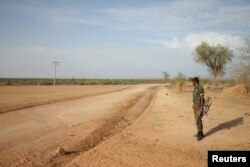 What will become of residents in Badme and other towns set to transfer to Eritrea is not yet clear. A timeline for sending the delegation has not been established, but some reports suggest Ethiopia will remove troops from occupied areas along the border in July. Ahmed’s pledge on the border issue is one of many reforms that the new prime minister has announced, leading to a wave of changes in the country. Ethiopia recently released thousands of dissidents and political prisoners who were arrested under a controversial anti-terrorism law.